With the Common Telematics Platform, Bosch is connecting trucks worldwide - Connectivity module developed in association with Daimler Trucks and Fleetboard, where it is used as the Truck Data Center - Energy-saving acceleration sensor makes homes even smarter Amsterdam, Netherlands – More convenience, more safety, and more possibilities: thanks to Bosch connectivity solutions, trucks, homes, and wearables are growing even smarter and more efficient, earning Bosch two CES 2018 Innovation Awards at CES Unveiled in Amsterdam on October 26, 2017. Every year, the prestigious award recognizes the best solutions ahead of the worlds largest electronics show and is an indicator of the trends of the future. Making life easier by connecting truck drivers and logistics professionals A tight schedule, high mileage, and constantly increasing traffic: every day, truck drivers and their vehicles have their work cut out for them. 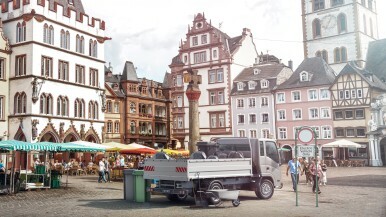 To help them master their task, drivers and trucking companies can count on support from Bosch. The Common Telematics Platform is the foundation for new digital services for commercial vehicles that allow trucking companies to do a better job of planning their transports, making more efficient use of their fleets, and getting goods to their destinations more safely, says Dr. Dirk Hoheisel, member of the Robert Bosch GmbH board of management. In recognition of its telematics solution for the cutting-edge connectivity of heavy commercial vehicles, Bosch received a CES 2018 Innovation Award in the category Tech For A Better World. The Common Telematics Platform was developed in association with Daimler Trucks and Fleetboard, and is used worldwide in the manufacturers heavy commercial vehicles as its Truck Data Center, where it acts as the foundation for new digital services such as Mercedes-Benz Uptime. The platform checks the technical status of trucks in real time and sends the information, allowing fleet managers to detect breakdowns before they happen, avoid unplanned repairs, and further optimize scheduled repair shop visits. This increases the reliability of transports and reduces costly truck downtime. In the future, Boschs Common Telematics Platform can enable over-the-air software updates. The wireless updates will keep vehicle systems up to date while saving drivers and fleet managers time by reducing the number of repair shop visits. They will also make it possible to install new and improved functions directly in trucks. A tiny sensor makes houses even smarter Extremely energy efficient, small, and powerful: these qualities have won the BMA400 acceleration sensor from Bosch Sensortec a CES 2018 Innovation Award in the category Embedded Technologies. The tiny sensor combines very low power consumption with high performance, thereby significantly extending the service life of batteries in devices. As a result, batteries need less frequent charging and replacement. The sensor also enables highly precise angle measurement and vibration recording, making the BMA400 particularly interesting for applications in the internet of things (IoT). In smart homes, the energy-saving acceleration sensor can recognize whether windows are open, tilted, or closed, for example, making it possible to set air conditioning or heating systems accordingly and save energy. When installed in doors and windows, the BMA400 detects motion and vibrations, helping deter burglaries. Thanks to smart energy management, the tiny sensor is also ideally suited for use in wearables. About the CES Innovation Awards The CES Innovation Awards are a program run by the Consumer Technology Association (CTA). Each year, the awards are presented in 28 categories. Bosch has already won awards in the past. In 2017, for example, Bosch was honored for a connected water heater and two innovative motorcycle solutions. In 2016, the technology company received recognition for neoSense, a touchscreen with haptic feedback. EXPERIENCE BOSCH AT CES 2018 in Las Vegas, U.S: The demand for safety, security, energy efficiency, and convenience in cities is growing. These are just a few of the challenges that are resulting from growing urbanization. The key to overcoming them is intelligently connected cities – known as smart cities. In many places, such cities are already a reality: Bosch has a multitude of solutions that are helping to make cities smarter and improve quality of life for their residents. At CES 2018, Bosch is showcasing an expanded portfolio of Simply.Connected. solutions for everything from urban mobility and the connected working world to intelligent homes and buildings. -PRESS CONFERENCE: Monday, Jan. 8, 2018, 8-8:45 a.m. (local time) at Mandalay Bay South Convention Center, Level 2, Mandalay Bay Ballrooms BCD. -BOSCH BOOTH: Tuesday to Friday, Jan. 9–12, 2018, in the Central Hall, booth #14028 -FOLLOW the Bosch CES 2018 highlights on Twitter: #BoschCES - PANELS WITH BOSCH EXPERTS: More information to come – stay tuned! Press photos: #452274, #1257451, #1257453, #1257454 Additional information: Video on vehicle connectivity Contact person for press inquiries: Annett Fischer, phone: +49 711 811-6286 Mobility Solutions is the largest Bosch Group business sector. In 2016, its sales came to 43.9 billion euros, or 60 percent of total group sales. This makes the Bosch Group one of the leading automotive suppliers. The Mobility Solutions business sector combines the groups expertise in three mobility domains – automation, electrification, and connectivity – and offers its customers integrated mobility solutions. Its main areas of activity are injection technology and powertrain peripherals for internal-combustion engines, diverse solutions for powertrain electrification, vehicle safety systems, driver-assistance and automated functions, technology for user-friendly infotainment as well as vehicle-to-vehicle and vehicle-to-infrastructure communication, repair-shop concepts, and technology and services for the automotive aftermarket. Bosch is synonymous with important automotive innovations, such as electronic engine management, the ESP anti-skid system, and common-rail diesel technology. The Bosch Group is a leading global supplier of technology and services. It employs roughly 390,000 associates worldwide (as of December 31, 2016). The company generated sales of 73.1 billion euros in 2016. Its operations are divided into four business sectors: Mobility Solutions, Industrial Technology, Consumer Goods, and Energy and Building Technology. As a leading IoT company, Bosch offers innovative solutions for smart homes, smart cities, connected mobility, and connected manufacturing. It uses its expertise in sensor technology, software, and services, as well as its own IoT cloud, to offer its customers connected, cross-domain solutions from a single source. The Bosch Groups strategic objective is to deliver innovations for a connected life. Bosch improves quality of life worldwide with products and services that are innovative and spark enthusiasm. In short, Bosch creates technology that is Invented for life. The Bosch Group comprises Robert Bosch GmbH and its roughly 440 subsidiaries and regional companies in some 60 countries. Including sales and service partners, Boschs global manufacturing and sales network covers nearly every country in the world. The basis for the companys future growth is its innovative strength. At 120 locations across the globe, Bosch employs some 59,000 associates in research and development. Additional information is available online at www.bosch.com, www.bosch-press.com, http://twitter.com/BoschPresse. Having established a regional presence in 1906 in North America, the Bosch Group employs nearly 34,500 associates in more than 100 locations, as of December 31, 2017. According to preliminary figures, in 2017 Bosch generated consolidated sales of $13.7 billion in the U.S., Canada and Mexico. For more information, visit twitter.com/boschusa, twitter.com/boschmexico and www.bosch.ca.